Will There Be A New Robot? Google and Johnson & Johnson's subsidiary company, Ethicon, have announced their collaboration to create the next advanced, robotic-assisted surgery platform. "The companies seek to develop new robotic tools and capabilities for surgeons and operating room professionals that integrate best-in-class medical device technology with leading-edge robotic systems, imaging and data analytics." Google X (the semi-secret organization run by Google, dedicated to making major technological advancements) has a specific division for medicine called Google Life Sciences. This small but fast-growing effort led by top physicians and researchers is looking to use data to help prevent people from getting sick rather than just treat sick people. Google Life Sciences hinted that they wanted to expand real-time image analysis to give surgeons better vision around the edges of nerves or tumors, add more sensors to tools, and consolidate visual information so they're looking at one screen rather than several to see images from MRIs, cameras and other systems. Google has recently bought companies who specialize in robotic technology across various industries. Their involvement brings about the significant factor of the data they possess from many years of extensive research and development in robotics. As Google is creating self-driving cars, artificial intelligence and strong technologies that focus on vision, stemmed from Google Glass technology, we could see this panning out to be quite revolutionary to the field. Knowing the amount of data Google houses, they could potentially have a huge impact on the future of robotic surgery and robotics in general. They also eluded to creating a system that collects and analyzes data as it performs surgeries for training and future development. The da Vinci Robotic Surgery System, was the first system of its kind and has become the gold standard in robotic surgery. 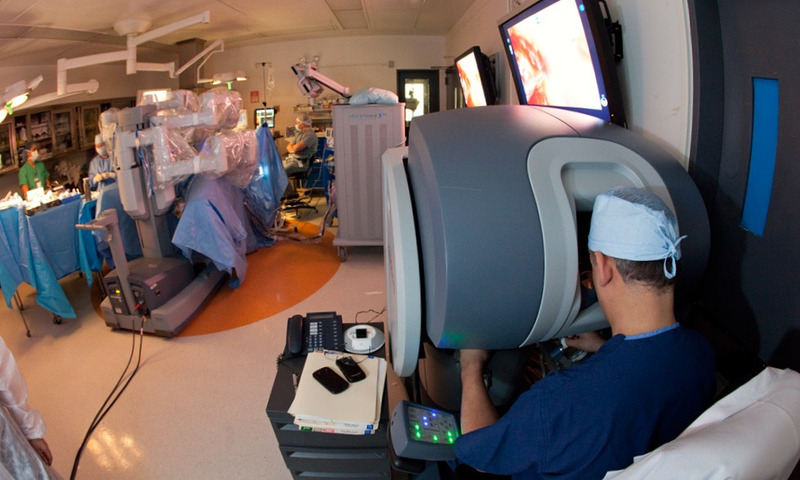 Existing platforms like the da Vinci Robot use high-definition, 3-D capable endoscopes. From there a video feed gives the surgeon optimal vision into the selected area. Similar technology powers the image-editing tools in Google’s photos app, as well as automated YouTube upload analysis that can recognize pirated content. The completion of this system is quite a few years out, however it has everyone in the robotics industry talking. Will a new robot emerge in the future? We'll wait and see.